I took this picture for an Instagram post last month and love it so much because it captures some of the botanical products I make or aromatherapy ingredients/tools I use for Botanically Me. I thought I’d explain a little about each item. We’ll start at the top left and move clockwise. #1 is a one-0unce beautiful glass jar with shiny silver lid that I use for my Rose F acial Balm. It can be difficult to find pretty jars for my products, and I was so happy to find this one. #2 is a green perfume atomizer I found at a discount store. I haven’t tried it out yet, but I will when I make an alcohol-based perfume. #3 is a vintage glass bartender stirrer that I discovered at my favorite vintage store. Glass stirrers can be hard to find today, as so many of them are plastic. Glass is perfect for using with essential oils because the glass won’t absorb the oil. I use these all the time when I’m making my products. #4 is a stunning glass perfume bottle that I found on my husband’s and my trip Kick Up Some Dust trip across the country last year. I got it at a discount price because one of the glass flower petals had fallen off and they had glued it back on. It’s barely discernible. I will have to make a very special perfume indeed to go in this special bottle. #5 is one of my heart-shaped pure beeswax candles that I make for my Etsy shop. 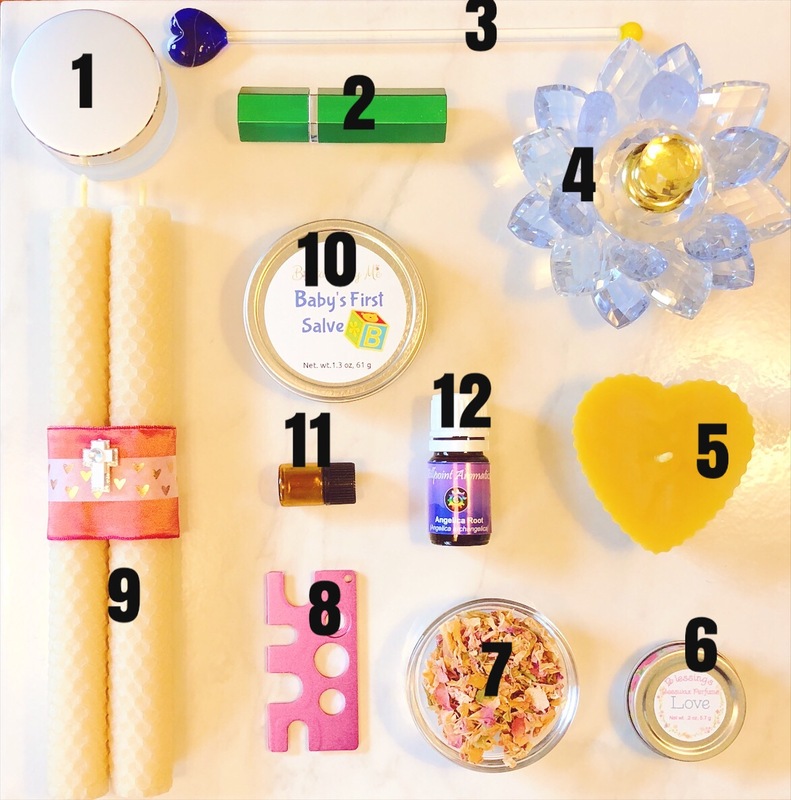 #6 is a tin of my Love Blessings Beeswax perfume that I make for my Etsy shop. It’s prominent notes are rose and sandalwood. #7 is a glass jar filled with dried rose petals. I just love working with rose petals and can’t stop myself from smelling them every five seconds. I use them in everything from sugar scrubs to bath teas to oil infusions. #8 is a handy little tool I found that removes orifice reducers from essential oil bottles. These can be particularly hard to get off, and this tool makes it much easier. I just wipe it off with alcohol before using it on another bottle. #9 is a set of my Blessings Beeswax Taper candles from my Etsy shop. These were very popular over the holidays. #10 is a tin of my Baby’s First Salve product. This is perfect to use as a diaper cream or on other irritated skin of baby. It’s even safe for newborns because there isn’t any essential oil in it. #11 is a tiny 2-ml glass bottle that I use when creating a custom perfume for a client. I like to use these to hold perfume samples. And finally, #12 is a bottle of Angelica essential oil. Angelica is used in the perfume industry and is a herbaceous, earthy, spicy aroma. It is either a mid or top note, depending on what else it’s blended with. It also has therapeutic properties for the respiratory, digestive, and reproductive systems. It’s known as an aphrodisiac and antispasmodic and can be useful for a depressed state of mind. Thanks for taking a peek into some of the tools I use and products I make in my business. If you have any questions, please just ask in the comment section.